After revealing his Slap Happy/Mr. Muggles custom and his Omen custom, Rob Ramirez (artist- ink_visuals) is revealing his next Designer Con ’18 show stopper — El Espiritu Viviante/The Living Spirit –this massive 20″ divination clairvoyant (Original sculpt by J*Ryu). 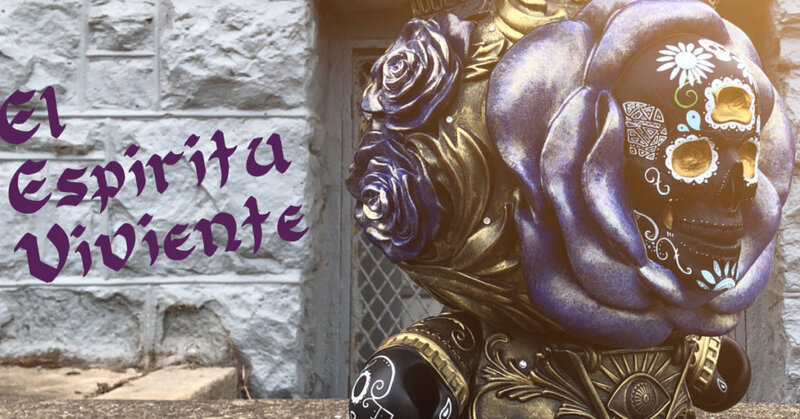 This pure masterpiece takes the extremely detailed form and adds the beautiful hand painted sugar skull aligned with the artist’s theme Dia De Los Muertos. Similar to the blue version you can find here on Rob Ramirez’s site, this custom sticks with the gold and blue tones but adds a spectacular sheen to both hues creating a regal and joyous piece, fit to be displayed and celebrated atop a golden pedestal. And, honestly, I love the detail in the paint on the skull so much! I can’t even imagine how epic this piece is in person! The shading on the gold pieces is absolutely incredible, giving it an antique and brilliant shine. Check out the blue flowers on the back; they are the perfect embellishments to this perfect piece. If you’d like to bask in its glory, this offering will be on display at Designer Con ’18 in Anaheim California November 16-18 in booth 2541. Seriously, if you haven’t seen our articles on his other pieces that will be there with this guy, check out Pájaro De La Muerte and GhostlySlaps. As always, a huge shout out to Ink_visuals/Rob Ramirez for the amazing work he is putting out! If you want to see more, check out his Website and Instagram!